Gravalos Ioannis, Loutridis Spyros, Gialamas Theodoros, Kateris Dimitrios, Xyradakis Panagiotis, Tsiropoulos Zisis, 2017. Dynamic behaviour of an in-pipe sensor-based platform for soil water monitoring, Computers and Electronics in Agriculture, Vol. 134, p.p. 11–18. Gravalos Ioannis, Georgiadis Anastasios, Kateris Dimitrios, Gialamas Theodoros, Bompolas Evagelos, Tsiropoulos Zisis, Avgoustis Avgoustinos, Xyradakis Panagiotis, 2017. An experimental simulation of moisture distribution and its uniformity within the soil profile under laboratory conditions, Precision Agriculture, Vol. 18, Issue 1, pp. 19-36. Gravalos I., Gialamas Th., Avgoustis A., Kateris D., Xyradakis P., Dimou V., Ioannidis L., & Pigis P., 2017. Non-Contact vibration measurements of a rotor-bearing system, 10th Hellenic Conference of Agricultural Mechanization, 28-29 September, Athens, p.p. 264-271. Giannoulis, K., Bartzialis, D., Skoufogianni, E., Gravalos, I., Xyradakis, P., Danalatos, N., 2017. Panicum virgatum L. Could be an alternative environmental friendly feedstock for energy production, SSRG International Journal of Agriculture & Environmental Science (SSRGIJAES), Vol. 4, Issue 1. Γράβαλος Ι., Γιαλαμάς Θ., Αυγουστής Α., Μόλλα Α., Κατέρης Δ., Ξυραδάκης Π., Ανδριώτης Ρ. και Κασόλας Π., 2017. Σύστημα τεχνητού φωτισμού με οικονομικούς λαμπτήρες για την παραγωγή λαχανικών σε θάλαμο καλλιέργειας, Πρακτικά 10ου Πανελλήνιου Συνεδρίου Γεωργικής Μηχανικής, 28-29 Σεπτεμβρίου, Αθήνα, σελ. 143-152. Γιαλαμάς Θ., Γράβαλος Ι., Κατέρης Δ., Γιαλαμά Α. & Ξυραδάκης Π., 2017. Κατασκευή καινοτόμου υδροστατικού ανοικτού συστήματος αδιαβάθμητης μεταφοράς ισχύος σε οχήματα, Πρακτικά 10ου Πανελλήνιου Συνεδρίου Γεωργικής Μηχανικής, 28-29 Σεπτεμβρίου, Αθήνα, σελ. 272-280. Κατέρης Δ., Γράβαλος Ι., Γιαλαμάς Θ., Ξυραδάκης Π. και Μόσχου Δ., 2017. Διερεύνηση της επίδρασης του αριθμού και της θέσης αισθητήρων δόνησης στην αξιοπιστία διάγνωσης βλαβών σε κιβώτιο σχέσεων, Πρακτικά 10ου Πανελλήνιου Συνεδρίου Γεωργικής Μηχανικής, 28-29 Σεπτεμβρίου, Αθήνα, σελ. 281-290. Αυγουστής Α., Παπαδόπουλος Σ., Γράβαλος Ι., Κατέρης Δ., Γεωργιάδης Α., Τσιρόπουλος Ζ., Ξυραδακης Π., 2017. Διερεύνηση της ρύπανσης ιζήματος με βαρέα μέταλλα στην αποστραγγιστική – αρδευτική τάφρο “Ασμακίου”, Θεσσαλία, Ελλάδα, Πρακτικά 10ου Πανελλήνιου Συνεδρίου Γεωργικής Μηχανικής, 28-29 Σεπτεμβρίου, Αθήνα, σελ. 436-446. Gialamas, Th., Gravalos, I., Kateris, D., Xyradakis, P., Dimitriadis, C., 2016. Vibration analysis on driver’s seat of agricultural tractors during tillage tests. Spanish Journal of Agricultural Research, Vol. 14, Issue 4. Gravalos I., Kateris D., Gialamas Th., Xyradakis P., Alfieris N., Pigis P., 2016. Edge detection in ficus carica tree images using fuzzy logic. Proceedings of the 6th International Conference TAE 2016 (Trends in Agricultural Engineering), 7-9 September, FE CULS Prague, Czech Republic, p.p. 155-161. Kateris D., Gravalos I., Gialamas Th., Xyradakis P., Moshou D., 2016. A new approach to fault diagnosis in agricultural tractor mechanical gearbox. Proceedings of the 6th International Conference TAE 2016 (Trends in Agricultural Engineering), 7-9 September, FE CULS Prague, Czech Republic, p.p. 290-299. Gravalos, I., Xyradakis, P., Kateris, D., Gialamas, Th., Loutridis, S. Avgousti, A., Georgiadis, A., Tsiropoulos, Z., 2016. Comparison and analysis of the emissions of a small non-road SI engine operating under different alcohol gasoline blended fuels. International Journal of Sustainable Energy, 35(3), pp. 258-266. Gravalos, I., Xyradakis, P., Kateris, D., Gialamas, Th., Bartzialis, D., Giannoulis, K., 2016. An experimental determination of gross calorific value of different agroforestry species and bio-based industry residues. Natural Resources, (In press). Xyradakis, P., Gravalos, I., Kateris, D., Gialamas, Th., Tsiropoulos, Z., Georgiadis, A., 2015 Engine performance test with different alcohol (C1-C5) gasoline blended fuels. Proceedings of XXXVΙ CIOSTA & CIGR Section V Conference on Environmentally friendly agriculture and forestry for future generations, 26-28 May, Saint-Petersburg, Russia. Tsiropoulos, Z., Fountas, S., Gravalos, I., Augoustis, A., Arslan, S., Misiewicz, P., Gemtos, T., 2015. Importance of measuring tillage implement forces for reduced fuel consumption and increased efficiency without affecting tillage depth. Proceedings of 10th European Conference on Precision Agriculture, Edited by John V. Stafford, Vageningen Academic Publishers, 12-16 July, Volcani Center, Israel. Gravalos, I., Georgiadis, A., Kateris, D., Haralampous, O., Gialamas, Th., Xyradakis, P., Tsiropoulos, Z., Bompolas, E., Manolakoudis, E., 2015. 3D soil moisture sensing and imaging. Proceedings of 10th European Conference on Precision Agriculture, Edited by John V. Stafford, Vageningen Academic Publishers, 12-16 July, Volcani Center, Israel. Gravalos, I., Kateris, D., Georgiadis, A., Gialamas, Th., Augoustis, A., 2015. Optimizing soil moisture uniformity and irrigation management. Proceedings of the 7th International Conference on Information and Communication Technologies in Agricultural, Food and Environment (HAICTA 2015), 17-20 September, Kavala, Greece. Κατέρης, Δ., Μόσχου, Δ., Γράβαλος, Ι., Γιαλαμάς, Θ., Ξυραδάκης, Π., 2015. Βελτίωση του χρόνου διάγνωσης βλαβών ενός ευφυούς συστήματος. Πρακτικά 9ου Εθνικού Συνεδρίου Γεωργικής Μηχανικής: «Καινοτομία και Νέες Τεχνολογίες στη Γεωργική Μηχανική και τη Διαχείριση Φυσικών Πόρων». Εταιρεία Γεωργικών Μηχανικών Ελλάδος, 8 & 9 Οκτωβρίου, Θεσσαλονίκη. Γιαλαμάς, Θ., Γράβαλος, Ι., Κατέρης, Δ., Γιαλαμά, Α., Ξυραδάκης, Π., 2015. Ασφάλεια χειριστών κατά τη χρήση γεωργικών μηχανημάτων. Πρακτικά 9ου Εθνικού Συνεδρίου Γεωργικής Μηχανικής: «Καινοτομία και Νέες Τεχνολογίες στη Γεωργική Μηχανική και τη Διαχείριση Φυσικών Πόρων». Εταιρεία Γεωργικών Μηχανικών Ελλάδος, 8 & 9 Οκτωβρίου, Θεσσαλονίκη. Αυγουστής, Α., Παπαδόπουλος, Σ., Γράβαλος, Ι., Κατέρης, Δ., Γεωργιάδης, Α., Τσιρόπουλος, Ζ., Ξυραδακης, Π., 2015. Διερεύνηση της ρύπανσης ιζήματος με βαρέα μέταλλα στην αποστραγγιστική – αρδευτική τάφρο “Ασμακίου” Θεσσαλίας, Ελλάδα. Πρακτικά 9ου Εθνικού Συνεδρίου Γεωργικής Μηχανικής: «Καινοτομία και Νέες Τεχνολογίες στη Γεωργική Μηχανική και τη Διαχείριση Φυσικών Πόρων». Εταιρεία Γεωργικών Μηχανικών Ελλάδος, 8 & 9 Οκτωβρίου, Θεσσαλονίκη. Kateris, D., Moshou, D., Pantazi, X-E., Gravalos, I., Sawalhi, N., Loutridis, S., 2014. A machine learning approach for the condition monitoring of rotating machinery. Journal of Mechanical Science and Technology, 28(1), pp. 61-71. Moshou, D., Pantazi, X-E., Kateris, D., Gravalos, I., 2014. Water stress detection based on optical multisensor fusion with a least squares support vector machine classifier. Biosystems Engineering, 117, pp. 15-22. Moshou, D., Natsis, A., Kateris, D., Pantazi, X-E., Kalimanis, I., Gravalos, I., 2014. Fault Detection of Fuel Injectors Based on One-Class Classifiers. Modern Mechanical Engineering, 4, pp. 19-27. Gravalos, I., Loutridis, S., Gialamas, Th., Avgousti, A., Kateris, D., Xyradakis, P., Tsiropoulos, Z., Libra M., 2014. Vibrational behavior of tractor engine hood. Fine Mechanics and Optics, 3, pp. 69-71. Gravalos, I., Tsiropoulos, Z., Kateris, D., Gialamas, Th., Xyradakis, P., Avgousti, A., Georgiadis, A., Fountas, S., 2014. Soil moisture remote monitoring from an agricultural tractor. Proceedings of 2nd International Conference on Robotics and associated High-technologies and Equipment for agriculture and forestry (RHEA-2014), 22-23 May, Madrid, Spain. Kateris, D., Moshou, D., Gialamas, Th., Gravalos, I., Xyradakis, P., Bearing fault diagnosis in mechanical gearbox based on time and frequency – domain parameters with MLP-ARD. Journal of Agricultural Machinery Science, 10(2), 101-106, (2014). Kateris, D., Gravalos, I., Gialamas, Th., Xyradakis, P., Georgiadis, A., Agarici, R., The effect of anti-vibration material on whole-body vibration exposures via the cabin-floor. Proceedings of International Conference of Agricultural Engineering (AgEng 2014), Zurich, Switzerland, 2014. Gialamas, Th., Zafiropoulos, A., Kateris, D., Gravalos, I., Xyradakis, P., Gialama, A., Vertical vibration measurement of the operator seat in an agricultural tractor, 18th World Congress of the International Commission of Agricultural and Biosystems Engineering (CIGR), Beijing, China, 2014. Gravalos, I., Moshou, D., Loutridis, S., Gialamas, Th., Kateris, D., Bompolas, E., Tsiropoulos, Z., Xyradakis, P., Fountas, S., 2013. 2D and 3D Soil Moisture Imaging Using a Sensor-Based Platform Moving Inside a Subsurface Network of Pipes. Journal of Hydrology, pp. 499, 146-153. Gravalos, I., Loutridis, S., Moshou, D., Gialamas, Th., Kateris, D., Tsiropoulos, Z., Xyradakis, P., 2013. Detection of fuel type on a spark ignition engine from engine vibration behaviour. Applied Thermal Engineering, 54(1), pp. 171-175. Gravalos, I., Moshou, D., Gialamas, Th., Xyradakis, P., Kateris, D., Tsiropoulos Z., 2013. Emissions characteristics of spark ignition engine operating on pure and high alcohol blended gasoline fuels. Renewable Energy, 50, pp. 27-32. Avgoustis, A., Papadopoulos, S., Kateris, D., Georgiadis, A., Gravalos, I., Xyradakis, P., Tsiropoulos, Z., 2013, Assessing quality of an irrigation canal ecosystems, through water and environmental parameters (temperature, total hardness, pH, D.O, EC, BOD5, COD, N, P, Na+, NO3-, Cl-, PO43-, NH4+ and SO4-). A case study in Thessaly region, Greece. WSEAS TRANSACTIONS on ENVIROMENTAL and DEVELOPMENT, 9 (3), pp. 181-194. Pantazi, X-E., Moshou, D., Kateris, D., Gravalos, I., Xyradakis, P., 2013. Automatic Identification of Gasoline – Biofuel Blend Type in an Internal Combustion Four-stroke Engine based on Unsupervised Novelty Detection and Active Learning. Procedia Technology, 8, pp. 229-237. Moshou, D., Kateris, D., Pantazi, X-E., Gravalos, I., 2013. Crop and weed species recognition based on hyperspectral sensing and active learning. Proceedings of 9th European Conference on Precision Agriculture, Edited by John V. Stafford, Vageningen Academic Publishers, 7-11 July, Lleida, Catalonia, Spain. Tsiropoulos, Z., Fountas, S., Gemtos, T., Gravalos, I., Paraforos, D., 2013. Management information system for spatial analysis of tractor-implement draft forces. Proceedings of 9th European Conference on Precision Agriculture, Edited by John V. Stafford, Vageningen Academic Publishers, 7-11 July, Lleida, Catalonia, Spain. Pantazi, X-E., Moshou, D., Kateris, D., Gravalos, I., Xyradakis, P., 2013. Automatic identification of fuel type in internal combustion engines based on vibration behavior and Least Squares Support Vector Machines (LSSVM). Proceedings of XXXV CIOSTA-CIGR V Conference, 3-5 July, Billund, Denmark. Moshou, D., Pantazi, X-E., Kateris, D., Gravalos, I., Mouazen, A-M., 2013. Cognitive fusion architectures for decision support in precision farming (FARMFUSE). Proceedings of XXXV CIOSTA-CIGR V Conference, 3-5 July, Billund, Denmark. Gravalos, I., Loutridis, S., Gialamas, Th., Avgousti, A., Kateris, D., Xyradakis, P., Tsiropoulos, Z., 2013. Vibrational behavior of tractor engine hood. Proceedings of the 5th International Scientific Conference on “Trends in Agricultural Engineering (TAE 2013)”, 3-6 September, Prague, Czech Republic. Pantazi, X-E., Moshou, D., Kateris, D., Gravalos, I., Xyradakis, P., 2013. Automatic prediction of gasoline-biofuel blend type in combustion four-stroke engine based on one class support vector machines. Proceedings of the 5th International Scientific Conference on “Trends in Agricultural Engineering (TAE 2013)”, 3-6 September, Prague, Czech Republic. Moshou, D., Pantazi, X-E., Kateris, D., Gravalos, I., Mouazen, A.M., 2013. Active learning sensor fusion system for crop disease detection. Proceedings of the 5th International Scientific Conference on “Trends in Agricultural Engineering (TAE 2013)”, 3-6 September, Prague, Czech Republic. Pantazi, X-E., Moshou, D., Kateris, D., Gravalos, I., Xyradakis, P., 2013. Automatic identification of gasoline – biofuel blend type in an internal combustion four-stroke engine based on unsupervised novelty detection and active learning. 6th International Conference on Information and Communication Technologies in Agricultural, Food and Environment (HAICTA 2013), 19-22 September, Corfu Island, Greece. Κατέρης, Δ., Μόσχου, Δ., Γράβαλος, Ι., Γιαλαμάς, Θ., Ξυραδάκης, Π., 2013. Σύστημα διάγνωσης βλαβών σε μηχανικό κιβώτιο σχέσεων με τη χρήση πολυστρωματικών νευρωνικών δικτύων. Πρακτικά 8ου Εθνικού Συνεδρίου Γεωργικής Μηχανικής: «Η Γεωργική Μηχανική μοχλός ανάπτυξης του αγροτικού τομέα». Εταιρεία Γεωργικών Μηχανικών Ελλάδος, 25 & 26 Σεπτεμβρίου, Βόλος. Γιαλαμάς, Θ., Γράβαλος, Ι., Κατέρης, Δ., Γιαλαμά, Μ., Ξυραδάκης, Π., Γιαλαμά, Α, Δημητριάδης, Χ., Τσιρόπουλος, Ζ., 2013. Πειραματικός προσδιορισμός των μηχανικών δονήσεων στο θάλαμο χειρισμού των ελκυστήρων από την αλληλεπίδραση των γεωργικών εργαλείων. Πρακτικά 8ου Εθνικού Συνεδρίου Γεωργικής Μηχανικής: «Η Γεωργική Μηχανική μοχλός ανάπτυξης του αγροτικού τομέα». Εταιρεία Γεωργικών Μηχανικών Ελλάδος, 25 & 26 Σεπτεμβρίου, Βόλος. Γράβαλος, Ι., Γιαλαμάς, Θ., Λουτρίδης, Σ., Κατέρης, Δ., Τσιρόπουλος, Ζ., Μπόμπολας, Ε., Ξυραδάκης, Π., Αυγουστή, Α., Γεωργιάδης, Α., 2013. Διδιάστατη και τριδιάστατη απεικόνιση της εδαφικής υγρασίας. Πρακτικά 8ου Εθνικού Συνεδρίου Γεωργικής Μηχανικής: «Η Γεωργική Μηχανική μοχλός ανάπτυξης του αγροτικού τομέα». Εταιρεία Γεωργικών Μηχανικών Ελλάδος, 25 & 26 Σεπτεμβρίου, Βόλος. Αυγουστή, Α., Παπαδόπουλος, Σ., Γράβαλος, Ι., Κατέρης, Δ., Γεωργιάδης, Α., Τσιρόπουλος, Ζ., Ξυραδάκης, Π., 2013. Ρύπανση ιζήματος με βαρέα μέταλλα στην αποστραγγιστική-αρδευτική τάφρο Ασμακίου, Θεσσαλίας, Ελλάδα. Πρακτικά 8ου Εθνικού Συνεδρίου Γεωργικής Μηχανικής: «Η Γεωργική Μηχανική μοχλός ανάπτυξης του αγροτικού τομέα». Εταιρεία Γεωργικών Μηχανικών Ελλάδος, 25 & 26 Σεπτεμβρίου, Βόλος. Γράβαλος, Ι., 2013. Τεχνικές κατάτμησης εικόνων δέντρων συκιάς στο στάδιο της καρποφορίας. Πρακτικά 8ου Εθνικού Συνεδρίου Γεωργικής Μηχανικής: «Η Γεωργική Μηχανική μοχλός ανάπτυξης του αγροτικού τομέα». Εταιρεία Γεωργικών Μηχανικών Ελλάδος, 25 & 26 Σεπτεμβρίου, Βόλος. Τσιρόπουλος, Ζ., Φουντάς, Σ., Γράβαλος, Ι., Γέμτος, Θ., Αυγουστή, Α., Κατέρης, Δ., Ξυραδάκης, Π., Λιάκος, Β., 2013. Λογισμικό χαρτογράφησης της κατανάλωσης καυσίμου γεωργικού ελκυστήρα. Πρακτικά 8ου Εθνικού Συνεδρίου Γεωργικής Μηχανικής: «Η Γεωργική Μηχανική μοχλός ανάπτυξης του αγροτικού τομέα». Εταιρεία Γεωργικών Μηχανικών Ελλάδος, 25 & 26 Σεπτεμβρίου, Βόλος. Πανταζή, Χ-Ε., Μόσχου, Δ., Κατέρης, Δ., Γράβαλος, Ι., Ξυραδάκης, Π., 2013. Αυτόματη αναγνώριση τύπου μίγματος βενζίνης-βιοαλκοολών σε τετράχρονο κινητήρα εσωτερικής καύσης με χρήση ταξινομητή προτύπου. Πρακτικά 8ου Εθνικού Συνεδρίου Γεωργικής Μηχανικής: «Η Γεωργική Μηχανική μοχλός ανάπτυξης του αγροτικού τομέα». Εταιρεία Γεωργικών Μηχανικών Ελλάδος, 25 & 26 Σεπτεμβρίου, Βόλος. Gravalos, I., Moshou, D., Loutridis, S., Gialamas, Th., Kateris, D., Tsiropoulos, Z., Xyradakis, P., 2012. Design of a pipeline sensor-based platform for soil water content monitoring. Biosystems Engineering, 113, pp. 1-10. Gravalos, I., Tsiropoulos, Z., Xyradakis, P., Moshou, D., Kateris, D., 2012. A low-cost greenhouse monitoring system based on internet connectivity. Acta Hort. (ISHS), 952, pp. 937-943. Moshou, D., Gravalos, I., Kateris, D., Bravo, C., Oberti, R., West, J. S., Ramon, H., 2012. Multisensor Fusion of Remote Sensing data for Crop Disease Detection. "Geospatial Techniques: Managing Environmental Resources". Edited Book by J.K., Thakur, S.K., Singh, A., Ramanathan, M.B.K., Prasad, and W., Gossel, Published by Springer-Verlag, Berlin Heidelberg, Germany. ISBN 978-94-007-1857-9. Moshou, D., Gravalos, I., Kateris, D., Natsis, A., Sawalhi, N., Loutridis, S., 2012. Condition monitoring in centrifugal irrigation pumps with self-organizing feature visualisation. "ICT for Agriculture, Rural Development and Environment". Edited Monograph by T. Mildorf and K. Charvat jr. Published by Czech Centre for Science and Society, Prague, Czech Republic. ISBN 978-80-905151-0-9. Gravalos, I., Loutridis, S., Moshou, D., Gialamas, Th., Kateris, D., Tsiropoulos, Z., Xyradakis, P., 2012. Vibration effects of bumper suspension system on pipeline sensor-based platform for soil water monitoring. Proceedings of 1st International Conference on Robotics and associated High-technologies and Equipment for agriculture (RHEA-2012), 19-21 September, Pisa, Italy. Gravalos, I., Moshou, D., Gialamas, Th., Kateris, D., Tsiropoulos, Z., Augousti, A., 2012. A study on spatial and temporal soil water distribution using an underground sensor-based platform. Proceedings of International Conference of Agricultural Engineering (CIGR-Ageng 2012), 8-12 July, Valencia, Spain. Moshou, D., Gravalos, I., Kateris, D., Pantazi, X.-E., 2012. Water stress detection based on Optical Multisensor Fusion with a Least Squares Support Vector Machine Classifier. Proceedings of International Conference of Agricultural Engineering (CIGR-Ageng 2012), 8-12 July, Valencia, Spain. Loutridis, S., Gialamas, T., Gravalos, I., Moshou, D., Kateris, D., Xyradakis, P., Tsiropoulos, 2011. A study on the effect of electronic engine speed regulator on agricultural tractor ride vibration behavior. Journal of Terramechanics, Vol. 48, Issue 2, pp. 139-147. Gravalos, I., Gialamas, Th., Loutridis, S., Moshou, D., Kateris, D., Xyradakis, P., Tsiropoulos Z., 2011. An experimental study on the impact of the rear track width on the stability of agricultural tractors using a test bench. Journal of Terramechanics, Vol. 48, Issue 4, pp. 319-323. Gravalos, I., Moshou, D., Gialamas, Th., Xyradakis, P., Kateris D., Tsiropoulos, Z., 2011. Performance and Emission Characteristics of Spark Ignition Engine Fuelled with Ethanol and Methanol Gasoline Blended Fuels. “Alternative Fuels”, Edited Book by Maximino Manzanera, Published by In-Tech, Rijeka, Croatia. ISBN 978-953-307-372-9. Gravalos, I., Tsiropoulos, Z., Xyradakis, P., Moshou, D., Kateris, D., 2011. A real time monitoring and control system targeted to support greenhouse automation & internet connectivity. “Proceedings of Advanced technologies and management towards sustainable greenhouse ecosystems” Greensys2011, 5–10 June, Chalkidiki, Greece. Moshou, D., Gravalos, I., Kateris, D., Sawalhi, N., Loutridis, S., 2011.Condition monitoing in centifugal irrigation pumps with self-organizing feature visualisation. Proceedings of 8th European Federation for Information Technology in Agriculture, Food and the Environment/ Wrld Congress on Computers in Agriculture, Edited by E. Gelb and K. Charvát, 11-14 July, Prague, Czech Republic. ISBN 978-80-904830-0-2. Gravalos, I., Moshou, D., Gialamas, T., Kateris, D., Tsiropoulos Z., Xyradakis P., 2011. Tracing boundaries of weeds using digital images. Proceedings of 8th European Conference on Precision Agriculture, Edited by John V. Stafford, 11-14 July, Prague, Czech Republic. ISBN 978-80-904830-2-6. Xyradakis, P., Gialamas, Th., Gravalos, I., Moshou, D., Kateris, D., Tsiropoulos, Z., Augusti, A., Tsatsarelis K., 2011. Emissions characteristics of spark ignition engine operating on pure and high alcohol blended gasoline fuels. Proceedings of XXXIV CIOSTA-CIGR V Conference on Efficient and safe production processes in sustainable agriculture and forestry, Edited by E. Quendler and K. Kössler, 29 June - 1 July, Vienna, Austria. ISBN 978-3-200-02204-1. Moshou, D., Kateris, D., Sawalhi, N., Gravalos, I., Loutridis, S., Gialamas, Th., Xyradakis, P., Tsiropoulos, Z., 2011. Condition monitoring of mechanical subsystems of agricultural vehicles based on fusion of vibration features. Proceedings of XXXIV CIOSTA-CIGR V Conference on Efficient and safe production processes in sustainable agriculture and forestry, Edited by E. Quendler and K. Kössler, 29 June - 1 July, Vienna, Austria. ISBN 978-3-200-02204-1. Gravalos, I., Moshou, D., Gialamas, Th., Kateris, D., Xyradakis, P., Tsiropoulos, Z., 2011. Vibration effects on spark ignition engine fuelled with methanol and ethanol gasoline blends. Journal of Agricultural Machinery Science, 7(4): 367-372. ISSN 1306-0007. Moshou, D., Natsis, A., Kateris, D., Gravalos, I., Sawalhi, N., Kalimanis, I., Loutridis, S., Gialamas, Th., Xyradakis, P., Tsiropoulos, Z., 2011. Tractor engine fault detection system based on vibration and acoustics monitoring. Journal of Agricultural Machinery Science, 7(1): 1-6. ISSN 1306-0007. Moshou, D., Kateris, D., Natsis, A., Gravalos, I., Sawalhi, N., Kalimanis, I., Gialamas, Th., Xyradakis, P., Tsiropoulos, Z., 2011. Agricultural vehicle condition monitoring system based on unsupervised novelty detection. Proceedings of 5th International Conference on Information and Communication Technologies in Agriculture, Food and Environment "HAICTA 2011", Edited by M. Salampasis and A. Matopoulos, 8-11 September, Skiathos, Greece. ISBN 978-960-89024-2-8. Poulek, V., Libra, Beránek, V., Sedláček, P., Mareš, J., Bican, P., Korostenský, T., Gravalos, I., 2011. Množství vyrobené elektrické energie ve fotovoltaických elektrárnách v České Republice. Solar Technika, 2: 52-54. ISSN 1338-0524. Θ. Γιαλαμάς, Δ. Κατέρης, Μ. Γιαλαμά, I. Γράβαλος, Π. Ξυραδάκης, Γ. Μενεξές, Α. Γεωργιάδης, Κ. Τσατσαρέλης, Θ. Γέμτος, 2011. Επίδραση των ακουστικών δονήσεων (θορύβου) στην υγεία των χειριστών γεωργικών ελκυστήρων. Πρακτικά 7ου Πανελληνίου συνεδρίου Γεωργικής Μηχανικής, Εταιρεία Γεωργικών Μηχανικών Ελλάδος, 24-27 Νοεμβρίου, Αθήνα. V. Poulek, M. Libra, Ι. Γράβαλος, Θ. Γιαλαμάς, Δ. Μόσχου, Π. Ξυραδάκης, Δ. Κατέρης, Ζ. Τσιρόπουλος, Θ. Λέλλης, 2011. Μελέτη αποτίμησης της απόδοσης Φ/Β συστημάτων εγκατεστημένων σε Ελλάδα και Τσεχία. Πρακτικά 7ου Πανελληνίου συνεδρίου Γεωργικής Μηχανικής, Εταιρεία Γεωργικών Μηχανικών Ελλάδος, 24-27 Νοεμβρίου, Αθήνα. Δ. Κατέρης, Δ. Μόσχου, Ι. Γράβαλος, Ν. Sawalhi, Θ. Γιαλαμάς, Π. Ξυραδάκης, Ζ. Τσιρόπουλος, 2011. Έλεγχος κατάστασης των μηχανικών υποσυστημάτων στα γεωργικά οχήματα, βασισμένος στην σύντηξη των χαρακτηριστικών των δονήσεων. Πρακτικά 7ου Πανελληνίου συνεδρίου Γεωργικής Μηχανικής, Εταιρεία Γεωργικών Μηχανικών Ελλάδος, 24-27 Νοεμβρίου, Αθήνα. Gravalos, I., Loutridis, S., Moshou, D., Gialamas, T., Kateris, D.,Tsiropoulos,Z., Xyradakis, P., Savoulidis, M., Koutsofitis, Z., 2010. An underground experimental autonomous platform for soil moisture monitoring. Proceedings of International Conference on Agricultural Engineering "AgEng 2010", 6-8 September, Clermont-Ferrand, France. Gravalos, I., Loutridis, S., Moshou, D., Gialamas, T., Kateris, D., Xyradakis, P., Tsiropoulos, Z., Georgiadis, A., 2010. Effects of the rotor systems on ball bearing dynamic characteristics. Proceedings of the 4th International Scientific Conference on "Trends in Agricultural Enginnearing, TAE 2010", 7-10 September, Faculty of Engineering Czech University of Life Sciences Prague, pp. 196-201. ISBN 978-80-213-2088-8. Loutridis, S., Gravalos, I., Moshou, D., Gialamas, T., Kateris, D., Xyradakis, P., Tsiropoulos, 2010. Diagnosis of gearbox faults in agricultural machinery using energy of transient features. Proceedings of the 4th International Scientific Conference on "Trends in Agricultural Enginnearing, TAE 2010", 7-10 September, Faculty of Engineering Czech University of Life Sciences Prague, pp. 406-409. ISBN 978-80-213-2088-8. Moshou, D., Kateris, D., Gravalos, I., Loutridis, S., Sawalhi, N., Gialamas, T., Xyradakis, P., Tsiropoulos, Z., 2010. Determination of fault topology in mechanical subsystems of agricultural machinery based on feature fusion and neutral networks. Proceedings of the 4th International Scientific Conference on "Trends in Agricultural Enginnearing, TAE 2010", 7-10 September, Faculty of Engineering Czech University of Life Sciences Prague, pp. 448-453. ISBN 978-80-213-2088-8. Gravalos, I., Kateris, D., Xyradakis, P., Tsiropoulos, Z., Libra, M., 2010. Studium výhřevnosti jednotlivých orgánů bavlníku. Jemná Mechanika A Optika, Volume 55 3-2010, pp. 79-81 ISSN 0447-6441. Gravalos I., Kateris D., Xyradakis P., Gialamas T., Loutridis S., Augousti A., Georgiades A., Tsiropoulos Z., 2010. A study on calorific energy values of biomass residue pellets for heating purposes. Proceedings of 43th Forestry Mechanization Symposium "FORMEC 2010", July 11–14, Padova, Italy. 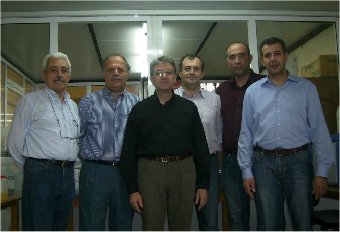 Dimitrios Moshou, Dimitrios Kateris, Nader Sawalhi, Spyridon Loutridis and Ioannis Gravalos, 2010. Fault Severity Estimation in Rotating Mechanical Systems Using Feature Based Fusion and Self-Organizing Maps. Lecture Notes in Computer Science, Volume 6353/2010, pp. 410-413. Ι. Γράβαλος, Θ. Γιαλαμάς, Ζ. Κουτσοφίτης, Δ. Κατέρης, Π. Ξυραδάκης, Ζ. Τσιρόπουλος, 2010. Η σημασία του εύρους των οπισθίων τροχών στην ευστάθεια γεωργικού ελκυστήρα. Γεωτεχνικά Επιστημονικά Θέματα, Σειρά VI, Τόμος 20, Τεύχος 1, σελ. : 4-11. ISSN 1105-9478. Gravalos, I., Gialamas, Th., Koutsofitis, Z., Kateris, D., Xyradakis, P., Tsiropoulos, Z., Lianos, G., 2009. Comparison of performance characteristics of agricultural tractor diesel engine operating on home and industrially produced biodiesel. International JournalofEnergy Research, 33 (12): 1048-1058. DOI: 10.1002/er.1533. Τσιρόπουλος, Ζ., Γαγάνης, Π., Τσιροπούλου, Α., Γράβαλος, Ι., Κατέρης, Δ., Ξυραδάκης, Π., 2009. Λογισμικό Χαρτογράφησης και Ταξινόμησης Γεωτρήσεων. Πρακτικά κοινού Συνεδρίου 11ο της Ελληνικής Υδροτεχνικής Ένωσης (ΕΥΕ) & 7ο της Ελληνικής Επιτροπής Διαχείρισης Υδάτινων Πόρων (ΕΕΔΥΠ), 27-30 Μαΐου , Βόλος, Τόμος II, σελ. : 661-668. ISBN 978-960-6865-05-3. Γράβαλος, Ι., Ατζέμης, Α., Σαββουλίδης Μ., Χαδίνη, Χ., Κατέρης, Δ., Ξυραδάκης, Π., Τσιρόπουλος, Ζ., Δαλακούρας, Α., 2009. Αυτόνομο Σύστημα Μέτρησης / Καταγραφής της Εδαφικής Υγρασίας. Πρακτικά κοινού Συνεδρίου 11ο της Ελληνικής Υδροτεχνικής Ένωσης (ΕΥΕ) & 7ο της Ελληνικής Επιτροπής Διαχείρισης Υδάτινων Πόρων (ΕΕΔΥΠ), 27-30 Μαΐου , Βόλος, Τόμος I, σελ. : 387-394. ISBN 978-960-6865-05-3. Gravalos, I., Gialamas, Th., Kateris, D., Xyradakis, P., Tsiropoulos, Z., Moshou, D., 2009. Vibration measurements and analysis of agricultural tractors operating on traditional and electronic regulator. Proceedings of XXXIII CIOSTA - CIGR V Conference on Technology and Management to Ensure Sustainable Agriculture, Agro Systems, Foresty and Safety, 17-19 June, Reggio Calabria, Italy, Vol. 2, pp. 1511-1515. ISBN 978-88-7583-031-2. Γράβαλος, Ι., Τσιρόπουλος, Ζ., Γιαλαμάς, Θ., Κατέρης, Δ., Ξυραδάκης, Π., 2009. Σύστημα διάγνωσης βλαβών κινητήρων diesel. Πρακτικά 6ου Πανελληνίου συνεδρίου Γεωργικής Μηχανικής, Εταιρεία Γεωργικών Μηχανικών Ελλάδος, 8-10 Οκτωβρίου, Θεσσαλονίκη. Γράβαλος, Ι., Γιαλαμάς, Θ., Κατέρης, Δ., Τσιρόπουλος, Ζ., Ξυραδάκης, Π., 2009. Υβριδικό σύστημα μετάδοσης της κίνησης. Πρακτικά 6ου Πανελληνίου συνεδρίου Γεωργικής Μηχανικής, Εταιρεία Γεωργικών Μηχανικών Ελλάδος, 8-10 Οκτωβρίου, Θεσσαλονίκη. Γιαλαμάς, Θ., Γράβαλος, Ι., Κατέρης, Δ., Ξυραδάκης, Π., Τσιρόπουλος, Ζ., Τσατσαρέλης, Κ., Μόσχου, Δ., Γέμπτος, Θ., 2009. Δονήσεις στο κάθισμα του χειριστή κατά τη διάρκεια άροσης με διαφορετικούς ελκυστήρες. Πρακτικά 6ου Πανελληνίου συνεδρίου Γεωργικής Μηχανικής, Εταιρεία Γεωργικών Μηχανικών Ελλάδος, 8-10 Οκτωβρίου, Θεσσαλονίκη. Γιαλαμάς, Θ., Κατέρης, Δ., Γράβαλος, Ι., Ξυραδάκης, Π., Τσιρόπουλος, Ζ., Δημητριάδης, Χ., Τσατσαρέλης, Κ., Γέμπτος, Θ., 2009. Δονήσεις στο κάθισμα του χειριστή σε κατεργασία εδάφους με δισκοσβάρνα. Πρακτικά 6ου Πανελληνίου συνεδρίου Γεωργικής Μηχανικής, Εταιρεία Γεωργικών Μηχανικών Ελλάδος, 8-10 Οκτωβρίου, Θεσσαλονίκη. Novotny, R., Libra, M., Poulek, V., Gravalos, I., Mares, J., 2009. Electric energy production in the small on-grid PV system. Proceedings of International Scientific Conference on Physics – Research and Education, 1 October, Nitra, Slovakia. Gravalos, I., Gialamas, Th., Moshou, D., Augousti, A., Kateris, D., Moschodimou, E., Xyradakis, P., Tsiropoulos, Z., Georgiadis, A., 2009. Maintenance of Hydraulic Systems based on Optical Monitoring of Contamination. Proceedings of International Scientific Conference on Sustainable Agricuture Engineering, 5-7 November, Sofia, Bulgaria. Gravalos, I., Gialamas, Th., Koutsofitis, Z., Kateris, D., Tsiropoulos, Z., Xyradakis, P., Georgiades, A., 2008. Energetic study on animal fats and vegetable oils using combustion bomb calorimeter. Journal of Agricultural Machinery Science, Vol. 4, No. 1, pp. 69-74. ISSN 1306-0007. Gravalos, I., Tsiropoulos, Z., Kateris, D., Gialamas, Th., Xyradakis, P., Tsiropoulou, A., 2008. An innovative software tool facilitates maintenance estimation of agricultural machinery diesel engine. Proceedings of International conference on agricultural engineering "AgEng 2008", 23-25 June, Hersonissos, Crete, Greece. Tsiropoulos, Z., Tsiropoulou, A., Gravalos, I., Gialamas, Th., Kateris, D., Xyradakis, P., 2008. GIS software tool for digitalization of Greek cartographic background. Proceedings of International conference on agricultural engineering "AgEng 2008", 23-25 June, Hersonissos, Crete, Greece. Gravalos, I., Kateris, D., Tsiropoulos, Z., Koutsofitis, Z., Gialamas, Th., Xyradakis, P., Augoustinos, A., Georgiades, A., 2008. An investigation on calorific energy distribution in cotton plant organs. Proceedings of the 1st International workshop on Physics in Life Sciences, 22 August, Prague, Czech Republic. ISBN 978-80-213-1804-5. Tsiropoulos, Z., Gaganis, P., Tsiropoulou, A., Kateris, D., Xyradakis, P., Gravalos, I., 2008. GIS application for drill digitalization. Proceedings of the 1st International workshop on Physics in Life Sciences, 22 August, Prague, Czech Republic. ISBN 978-80-213-1804-5. Gravalos, I., Gialamas, Th., Koutsofitis, Z., Kateris, D., Tsiropoulos, Z., Xyradakis, P., Georgiades, A., 2008. Energetic study on animal fats and vegetable oils using combustion bomb calorimeter. Proceedings of 10th International Congress on Mechanization and Energy in Agricultural "AntAgEng 2008", 14-17 October, Antalya, Turkey. ISBN 978-975-7666-93-6. Γράβαλος, Ι., Γιαλαμάς, Θ., Κουτσοφίτης, Ζ., Κατέρης, Δ., Τσιρόπουλος, Ζ., Ξυραδάκης, Π., 2008. Μελέτη των παραγόντων που επηρεάζουν τις κινηματικές ιδιότητες ενός γεωργικού ελκυστήρα κατά την κίνησή του σε κεκλιμένο επίπεδο και την ασφάλεια του χειριστή του. Γεωτεχνικά Επιστημονικά Θέματα, Σειρά I, Τόμος 19, Τεύχος 1, σελ. : 27-37. ISSN 1105-9478. Gravalos, I., Gialamas, T., Kateris, D., Xyradakis, P., Tsiropoulos, Z., Ralli, M., 2007. A control system to achieve optimum soil water conditions for plant growth. Proceedings of the 3rd International Scientific Conference on "Trends in Agricultural Enginnearing, TAE 2007", 12-14 September, FE CULS Prague, pp. 115-120. ISBN 978-80-213-1668-3. Gravalos, I., Tsiropoulos, Z., Kateris, D., Gialamas, T., Xyradakis, P., Ralli, M., Libra, M., 2007. A software tool to compute autonomous photovoltaic water pumping systems. Proceedings of the 3rd International Scientific Conference on "Trends in Agricultural Enginnearing, TAE 2007", 12-14 September, FE CULS Prague, pp. 121-125. ISBN 978-80-213-1668-3. Γράβαλος, Ι., Γιαλαμάς, Θ., Κουτσοφίτης, Ζ., Αυγουστής, Α., Λιανός, Γ., Κατέρης, Δ., Ξυραδάκης, Π., Τσιρόπουλος, Ζ., Λέλλης, Θ., 2007. Πειραματικά δεδομένα από τη χρήση βιοντίζελ ως καύσιμο σε πετρελαιοκινητήρα γεωργικού ελκυστήρα. Πρακτικά 5ου Πανελληνίου συνεδρίου Γεωργικής Μηχανικής, Εταιρεία Γεωργικών Μηχανικών Ελλάδος, Λάρισα, σελ. : 699-706. Γράβαλος, Ι., Γιαλαμάς, Θ., Κουτσοφίτης, Ζ., Αυγουστής, Α., Κατέρης, Δ., Ξυραδάκης, Π., Τσιρόπουλος, Ζ., 2007. Αντιμετώπιση προβλημάτων από την εγκατάσταση μετρητή κατανάλωσης στο σύστημα τροφοδοσίας καυσίμου. Πρακτικά 5ου Πανελληνίου συνεδρίου Γεωργικής Μηχανικής, Εταιρεία Γεωργικών Μηχανικών Ελλάδος, Λάρισα, σελ. : 44-51. Γράβαλος, Ι., Τσιρόπουλος, Ζ., Γιαλαμάς, Θ., Κουτσοφίτης, Ζ., Ξυραδάκης, Π., Κατέρης, Δ., Ντάφας, Ε., Λέλλης, Θ., 2007. AMADA: Μία πολυχρηστική βάση δεδομένων για γεωργικά μηχανήματα αγρών. Πρακτικά 5ου Πανελληνίου συνεδρίου Γεωργικής Μηχανικής, Εταιρεία Γεωργικών Μηχανικών Ελλάδος, Λάρισα, σελ. : 779-786. Γιαλαμάς, Θ., Κατέρης, Δ., Γράβαλος, Ι., Ξυραδάκης, Π., Τσατσαρέλης, Κ., 2007. Πειραματική ανάλυση των γωνιών ευστάθειας για εγκάρσια κίνηση σε κεκλιμένο επίπεδο. Πρακτικά 5ου Πανελληνίου συνεδρίου Γεωργικής Μηχανικής, Εταιρεία Γεωργικών Μηχανικών Ελλάδος, Λάρισα, σελ. : 87-94. Γιαλαμάς, Θ., Παπαχρήστου, Ε., Γράβαλος, Ι., Κατέρης, Δ., Δημητριάδης, Χ., Τσατσαρέλης, Κ., 2007. Πρόγραμμα υπολογισμού υδραυλικού ανελκυστήρα μεταφοράς αγροτικών προϊόντων. Πρακτικά 5ου Πανελληνίου συνεδρίου Γεωργικής Μηχανικής, Εταιρεία Γεωργικών Μηχανικών Ελλάδος, Λάρισα, σελ. : 73-79. Γιαλαμάς, Θ., Γράβαλος, Ι., Ανδρέου, Α., Τσάντζος, Σ., Κατέρης, Δ., Τσατσαρέλης, Κ., Γέμτος, Θ., 2007. Πειραματικός προσδιορισμός της αναπτυσσόμενης έλξης και ολίσθησης με ομοίωμα τροχοφόρου ελκυστήρα. Πρακτικά 5ου Πανελληνίου συνεδρίου Γεωργικής Μηχανικής, Εταιρεία Γεωργικών Μηχανικών Ελλάδος, Λάρισα, σελ. : 65-72. Γιαλαμάς, Θ., Γράβαλος, Ι., Κατέρης, Δ., Ξυραδάκης, Π., Τσατσαρέλης, Κ., Γέμτος, Θ., 2007. Πειραματικός προσδιορισμός των δονήσεων στο θάλαμο χειρισμού των γεωργικών ελκυστήρων. Πρακτικά 5ου Πανελληνίου συνεδρίου Γεωργικής Μηχανικής, Εταιρεία Γεωργικών Μηχανικών Ελλάδος, Λάρισα, σελ. : 79-86. Δημητριάδης, Χ. Ι., Brighton, J. L., Κόκκορας, Ι., Γράβαλος, Ι., Γιαλαμάς, Θ. Α., 2007. Σχεδιασμός, κατασκευή και βελτιστοποίηση μηχανήματος συγκομιδής του άνθους της λεβάντας. Πρακτικά 5ου Πανελληνίου συνεδρίου Γεωργικής Μηχανικής, Εταιρεία Γεωργικών Μηχανικών Ελλάδος, Λάρισα, σελ. : 95-102. Αυγουστής, Α., Σαπουντζής, Μ., Κατέρης, Δ., Γράβαλος, Ι., Ξυραδάκης, Π., 2007. Προσδιορισμός των γεωμορφολογικών και εδαφοκλιματικών χαρακτηριστικών της λεκάνης τροφοδοσίας της τεχνητής λίμνης Σμοκόβου με τη χρήση των Γ.Σ.Π. (GIS). Πρακτικά 5ου Πανελληνίου συνεδρίου Γεωργικής Μηχανικής, Εταιρεία Γεωργικών Μηχανικών Ελλάδος, Λάρισα, σελ. : 787-794. Γράβαλος, Ι., Γιαλαμάς, Θ., Κουτσοφίτης, Ζ., Αυγουστής, Α., Κατέρης, Δ., Ξυραδάκης, Π., Λιανός, Γ., Τσιρόπουλος, Ζ., Γεωργιάδης, Α., 2007. Η χρήση βιοντίζελ στην κίνηση των γεωργικών ελκυστήρων. Πρακτικά Επιστημονικού Τριημέρου "Ανανεώσιμες Πηγές Ενέργειας", Τεχνικό Επιμελητήριο Ελλάδας, 29, 30 Νοεμβρίου & 1 Δεκεμβρίου, Λάρισα. Φιλίντας, Α., Ντιούδης, Π., Γράβαλος, Ι., Κουτσέρης, Ε., 2007. Ελεγχόμενη Στάγδην Άρδευση στον Αραβόσιτο (ZEA MAYS L.): Επίδραση στην Παραγωγή και στην Αναλογία Βιομάζας στα διάφορα μέρη του Φυτού και Περιβαλλοντικές Επιπτώσεις. Πρακτικά διεπιστημονικού συνεδρίου JEAN MONNET, 30 Νοεμβρίου & 1 Δεκεμβρίου, Βέροια. Γράβαλος, Ι., Γιαλαμάς, Θ., Κουτσοφίτης, Ζ., Κατέρης, Δ., Ξυραδάκης, Π., Λιανός Γ., Τσιρόπουλος, Ζ., 2007. Πειραματική Μονάδα Παραγωγής Βιοντίζελ. Γεωργία-Κτηνοτροφία, Τεύχος 1, σελ. : 38-44. ISSN 1105-2465. Γράβαλος, Ι., Γιαλαμάς, Θ., Κουτσοφίτης, Ζ., Αυγουστής, Α., Κατέρης, Δ., Ξυραδάκης, Π., Λιανός, Γ., Τσιρόπουλος, Ζ., 2007. Η χρήση βιοντίζελ από φυτικά έλαια ως καύσιμο των γεωργικών ελκυστήρων. Γεωργία-Κτηνοτροφία, Τεύχος 4, σελ. : 36-39. ISSN 1105-2465. Gravalos, I., Kateris, D., Xyradakis, P., Gialamas, Th., 2006. Cavitation erosion of wet-sleeve liners: Case study. Journal of Middle European Construction and Design of Cars (MECCA), Vol. IV, No. 3, pp. 10-16. ISSN 1214-0821. Gravalos, I., Kateris, D., Dimitriadis, Ch., 2006. Cavitation erosion of wet-sleeve liners: Case study. KOKA 2006, XXXVII International Conference of Czech and Slovak Universities’ Departments and Institutions Dealing with the Research of Combustion Engines, 19-20 September, Kostelec N.Č.L., p. 22. ISBN 80-213-1510-5. Gialamas, Τh., Bochtis, D., Ampatzidis, Y., Kateris, D., Gemtos, Th. Α., Tsatsarelis, C.Α., 2006. Tractor stability estimation using adjusting testing-bench. 3rd HAICTA International Conference on “Information Systems in Sustainable Agriculture, Agroenvironment and Food Technology”,20-23 September 2006,Volos,Greece, p.179-186. Γράβαλος, Ι., Ντιούδης, Π., Φιλίντας, Αγ., Κατέρης, Δ., Μόλλα, Α., 2006. Πειραματικός προσδιορισμός της θέσης των αισθητήρων εδαφικής υγρασίας σε συνθήκες στάγδην άρδευσης. Πρακτικά 10ου Πανελληνίου Επιστημονικού Συνεδρίου Ελληνικής Υδροτεχνικής Ένωσης (Ε.Υ.Ε. ), 13-16 Δεκεμβρίου, Ξάνθη, Τόμος Β΄, σελ. : 769-776. ISBN 960-6653-14-5. Γράβαλος, Ι., Ντιούδης, Π., Φιλίντας, Αγ., Κατέρης, Δ., Δημητριάδης, Χ., 2006. Συγκριτική μελέτη αισθητήρων μέτρησης εδαφικής υγρασίας. Πρακτικά 10ου Πανελληνίου Επιστημονικού Συνεδρίου Ελληνικής Υδροτεχνικής Ένωσης (Ε.Υ.Ε. ), 13-16 Δεκεμβρίου, Ξάνθη, Τόμος Β΄, σελ. : 837-844. ISBN 960-6653-14-5. Φιλίντας, Αγ., Ντιούδης, Π., Γράβαλος, Ι., Κουτσερής, Ε., Γιαλαμάς, Θ., 2006. Μελέτη της επίδρασης της στάγδην άρδευσης στην παραγωγή του αραβόσιτου σε πειραματικό αγρό. Πρακτικά 10ου Πανελληνίου Επιστημονικού Συνεδρίου Ελληνικής Υδροτεχνικής Ένωσης (Ε.Υ.Ε. ), 13-16 Δεκεμβρίου, Ξάνθη, Τόμος Β΄, σελ. : 653-660. ISBN 960-6653-14-5. Γράβαλος, Ι., Κατέρης, Δ., Βελιώτης, Ι., Σεραφείμ, Γ., 2006. Διαγνωστική συσκευή αξιολόγησης της τεχνικής κατάστασης αντλιών. Τεχνική Επιθεώρηση, Τεύχος 165, σελ. : 32-35. Γράβαλος, Ι., Ράπτης, Ι., 2005. Μέτρηση παραμέτρων της ισχύος ενός κινητήρα εσωτερικής καύσης. Γεωτεχνικά Επιστημονικά Θέματα, Σειρά VI, Τόμος 16, Τεύχος 2, σελ. : 12-19. ISSN 1105-9478. Γράβαλος, Ι., Ράπτης, Ι., 2005. ΔΙΑΣ: Ένα σύστημα «Διάγνωσης επί του οχήματος» για κινητήρες εσωτερικής καύσης. Γεωτεχνικά Επιστημονικά Θέματα, Σειρά VI, Τόμος 16, Τεύχος 2, σελ. : 20-30. ISSN 1105-9478. Γράβαλος, Ι., 2005. Προσδιορισμός χρόνου έναρξης άρδευσης με τη χρήση ηλεκτρονικού ανιχνευτή. Γεωτεχνικά Επιστημονικά Θέματα, Σειρά VI, Τόμος 16, Τεύχος 4, σελ. : 15-22. ISSN 1105-9478. Gravalos, I., Raptis, I., Varvoutis, I., Tsikas, D., 2005. A Distributed Monitoring System for Agricultural Applications. Proceedings of the II International Scientific Conference on "Information Technologies and Control Engineering in Management of Production Systems", 20-22 September, TF CUA Prague. Tome I, pp. 60-67. ISBN 80-213-1358-7. Γράβαλος, Ι., Γιαλαμάς, Θ., Ράπτης, Ι., Κατέρης, Δ., 2005. Διερεύνηση της επίπτωσης των φθαρμένων ελαστικών στην κατανάλωση καυσίμου. Πρακτικά 4ου Πανελληνίου συνεδρίου Γεωργικής Μηχανικής, Εταιρεία Γεωργικών Μηχανικών Ελλάδος, Αθήνα, σελ. : 185-193. ISBN 960-8002-36-2. Γιαλαμάς, Θ., Γράβαλος, Ι., Φιλίντας, Α., Κουτσοφίτης, Ζ., 2005. Προσδιορισμός του συντελεστή παραμόρφωσης του εδάφους με τη βοήθεια πειραματικού οχήματος. Πρακτικά 4ου Πανελληνίου συνεδρίου Γεωργικής Μηχανικής, Εταιρεία Γεωργικών Μηχανικών Ελλάδος, Αθήνα, σελ. : 80-88. ISBN 960-8002-36-2. Γράβαλος, Ι., Ράπτης, Ι., Κατέρης, Δ., Βελιώτης, Ι., Σεραφείμ, Γ., 2005. Διαγνωστική συσκευή αξιολόγησης της τεχνικής κατάστασης της αντλίας υδραυλικού των γεωργικών ελκυστήρων. Πρακτικά 4ου Πανελληνίου συνεδρίου Γεωργικής Μηχανικής, Εταιρεία Γεωργικών Μηχανικών Ελλάδος, Αθήνα, σελ. : 71-79. ISBN 960-8002-36-2. Γιαλαμάς Θ.Α, Ι.Λ. Χαλούλης, Ζ.Ι. Κουτσοφίτης, Α.Θ. Φιλίντας, Κ.Α. Τσατσαρέλης, Α.Η.Τσάκαλος, Κ.Η. Μανώλης, 2005. Πειραματική τράπεζα προσδιορισμού των γωνιών ευστάθειας γεωργικών ελκυστήρων. Πρακτικά 4ου Πανελληνίου συνεδρίου Γεωργικής Μηχανικής, Εταιρεία Γεωργικών Μηχανικών Ελλάδος, Αθήνα. Ιωσηφίδης Α.Ι, Κ.Α. Τσατσαρέλης, Θ.Α. Γέμτος, Θ.Α. Γιαλαμάς, Χ. Καβαλάρης, Χ. Καραμούτης, 2005. Μετρήσεις παραμέτρων στο εργαστήριο και στον αγρό που επηρεάζουν την έλξη των ελκυστήρων. Πρακτικά 4ου Πανελληνίου συνεδρίου Γεωργικής Μηχανικής, Εταιρεία Γεωργικών Μηχανικών Ελλάδος, Αθήνα. Γράβαλος, Ι., 2005. Η ψηφιακή επεξεργασία και η ανάλυση εικόνων στη γεωργική μηχανική. Μία επισκόπηση. Γεωργία-Κτηνοτροφία, Τεύχος 4, σελ. : 42-52. ISSN 1105-2465. Γράβαλος, Ι., Ράπτης, Ι., 2004. Από τα τοπολογικά συστήματα καθοδήγησης, στην πλοήγηση των αυτοκινούμενων γεωργικών μηχανημάτων μέσω του συστήματος GPS. Γεωργία-Κτηνοτροφία, Τεύχος 6, σελ. : 71-77. ISSN 1105-2465. Γράβαλος, Ι., 2003. Τεχνική εισαγωγής λάθους στο λογισμικό ελέγχου του ρυθμιστή στροφών των γεωργικών ελκυστήρων. Πρακτικά 3ου Πανελληνίου συνεδρίου Γεωργικής Μηχανικής, Εταιρεία Γεωργικών Μηχανικών Ελλάδος, Θεσσαλονίκη, σελ. : 207-213. Γράβαλος, Ι., 2003. Διακοπτικός ελεγκτής εδαφικής υγρασίας. Πρακτικά 3ου Πανελληνίου Συνεδρίου Γεωργικής Μηχανικής, Εταιρεία Γεωργικών Μηχανικών Ελλάδος, Θεσσαλονίκη, σελ. : 325-334. Γιαλαμάς Θ. Α., Κουτσοφίτης Ζ. Ι., Φιλίντας Α.Θ. ,2003. Τράπεζα δοκιμών για τον καθορισμό της ευστάθειας Γεωργικών Μηχανημάτων. Πρακτικά 3ου Πανελληνίου Συνεδρίου Γεωργικής Μηχανικής, Εταιρεία Γεωργικών Μηχανικών Ελλάδος, Θεσσαλονίκη. Φιλίντας Α.Θ., Δούκας Κ.Ι., Γιαλαμάς Θ.Α., Στανιός Β.Α., 2003. Τα πολυμέσα Η/Υ ως εργαλείο ενίσχυσης της εκπαιδευτικής διαδικασίας στη Γεωργική Μηχανική. Πρακτικά 3ου Πανελληνίου Συνεδρίου Γεωργικής Μηχανικής, Εταιρεία Γεωργικών Μηχανικών Ελλάδος, Θεσσαλονίκη. Γράβαλος, Ι., Κουφόπουλος, Δ., 2003. Η αρχιτεκτονική των συστημάτων ελέγχου στα αυτοκινούμενα γεωργικά μηχανήματα. Γεωργία-Κτηνοτροφία, Τεύχος 4, σελ. : 73-77. ISSN 1105-2465. Γράβαλος, Ι., Ράπτης, Ι., 2003. Η τεχνολογία «CAN BUS» ένα εργαλείο στην υπηρεσία της τηλεδιαγνωστικής. Γεωργία-Κτηνοτροφία, Τεύχος 7, σελ. : 48-54. ISSN 1105-2465. Γράβαλος, Ι., 2001. Το ηλεκτρονικά ελεγχόμενο υδραυλικό σύστημα των γεωργικών ελκυστήρων. Γεωργία-Κτηνοτροφία, Τεύχος 8, σελ: 42-51. ISSN 1105-2465. EMEST Lab is a group of multidisciplinary specialists, which is focused on applied research to solve real world problems in the Agricultural Engineering Technology. Since 2006 EMEST LAB operates at the Department of Biosystems Engineering at the Technological Educational Institute of Thessaly (Greece). The laboratory conducts applied research in the area of Agricultural Engineering Technology. With excellent infrastructure and solid organization, it undertakes the implementation of research projects and the development of innovative products and applications independently or in cooperation with other Research Centers and Universities. EMEST LAB consists of a group of multidisciplinary specialists with long-time research and professional expertise. The research activities of the laboratory cover the following key areas: (a) Sensors, Automation & Robotics in Agriculture, (b) Development and Design of Agricultural Machinery, (c) Vibration Analysis & Non-destructive testing of rotating machines, (d) Biofuel Technologies & Engines, and (e) Health & Safety at Work in Agriculture.